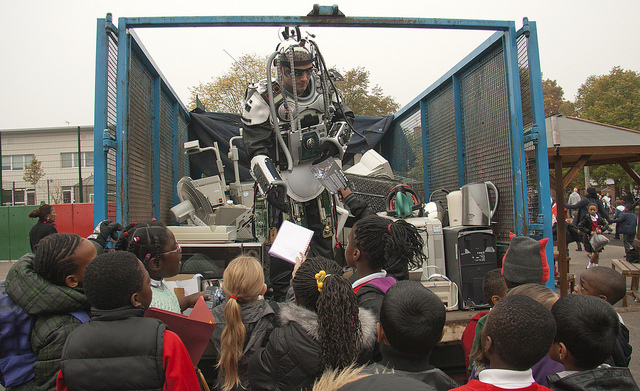 The Clean and Green Schools programme started 14 years ago and is a campaign aimed at raising awareness in green issues and encouraging young people to look after their local environment. The programme has produced some truly wonderful work, from various schools across Lewisham. This year, 8 schools took part in the programme and we were thrilled to see the efforts the schools went to, in order to make their school as Clean and Green as possible. When this programme is fully embraced, it can really cultivate school pride amongst teachers and pupils alike, as well as help schools create lasting relationships within their local communities. 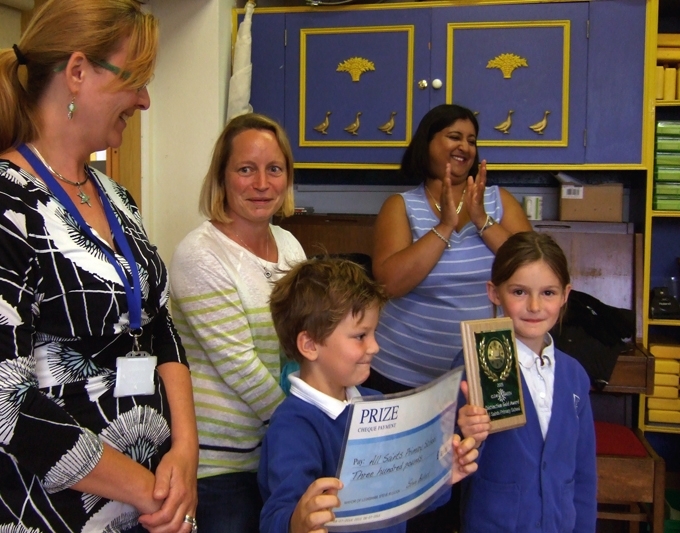 The overall winner of the programme for 2015, winning the Distinction Gold Award and a cheque for £300 was awarded to All Saints Primary School, in Blackheath. 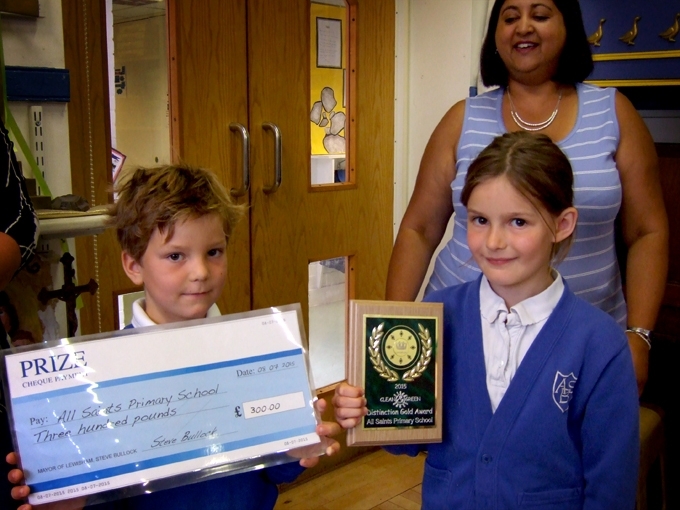 This week, judges and organisers of the Clean and Green Schools programme visited All Saints Primary School to award them with their well-deserved prize, and to thank them for their participation and wonderful achievements that the whole school community were involved in. From regular audits, improvements to recycling facilities and clean ups, to Fairtrade cafes, cook-ups and fashion parades, All Saints involved not only the school, but the wider community. Impressing the judges, All Saints went to great lengths to ensure that many of the activities were not one-off events but became part of the school’s sustained culture. The judges were astounded to discover that All Saints researched Fairtrade clothing companies to then use this clothing as part of their school uniforms. This was very innovative and also showed a genuine desire to integrate sustainable practices into the school. All Saints, have done an absolutely fantastic job! On behalf of Lewisham Council, we would like to thank you very much for taking part in the programme and for being such an inspiring school! 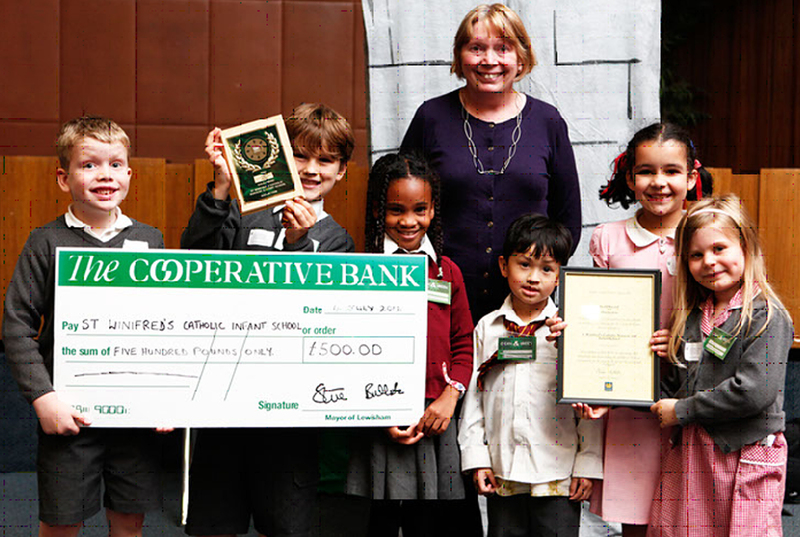 Categories: community engagement, Environmental Campaigns | Tags: All Saints School, Clean and Green, Clean and Green Awards 2015, Clean and Green Programme, Environmental awards for schools, Fairtrade, Gold award, Green school awards, Lewisham Schools, Pupil and community involvement, School awards, Sustainability | Permalink. Hot and refreshing, nothing beats a good cup of tea. Making it, and popping that little tea bag into a steaming cup just gives you a happy feeling. But happy feelings aren’t necessarily what the farmers and workers have when they are growing and harvesting the tea. 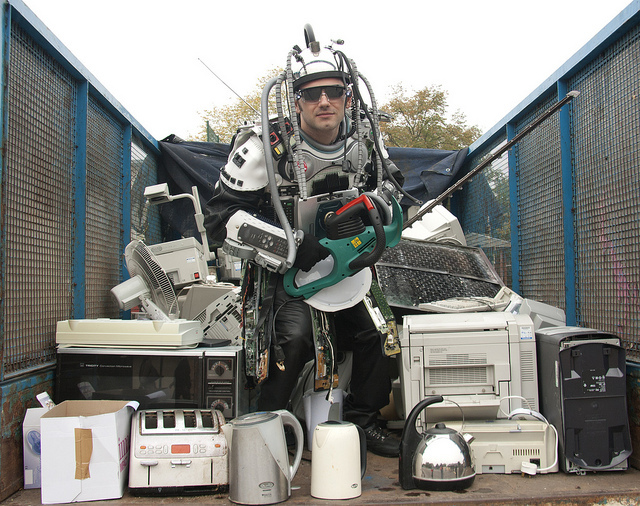 Many work long hours, are underpaid, and live in poverty. Health clinics, running water, electricity and adequate schooling for their children are just things to dream about, rather than a reality. They often cannot even enjoy a cup of tea that they’ve grown themselves. Thankfully, Fairtrade is working to bring better working conditions, better pay and better community facilities and infrastructure to these people. Farmers associated with Fairtrade now wear smiles as they see their kids furthering their education, bridges being built to connect isolated villages, and medical clinics opening to provide help for the sick. Each year, Fairtrade week highlights the need for more support for these and the many communities who are not yet benefiting from this organisation. One way of raising awareness is getting our local schools involved. Here in Lewisham, primary schools have been studying the lives of people around the globe who produce goods such as tea and the great things Fairtrade do. 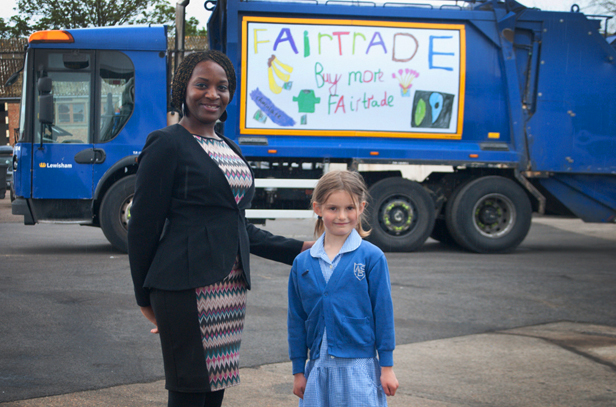 Encouraged by Lewisham Council, Lewisham kids have been designing Fairtrade posters to enter a competition where the winner’s poster is used on the side of one of our recycling lorries. This year’s winner was Isla Prosser from All Saint’s Church of England Primary School. By choosing Fairtrade products you’re helping to transform the livelihoods of more than 1.4 million people in 74 countries around the world! I’d have a cup of Fairtrade tea to that! Categories: community engagement, Environmental Campaigns, fairtrade, Food waste, Schools, Uncategorized | Tags: All Saints School, Cllr Onikosi, Fairtrade, Fairtrade 2015, Lewisham Council, poster competition, tea | Permalink.